The purpose of conservation missions should be two-fold: to save species and/or habitats and to augment the conservation tools of local communities where projects take place. At Pacific Bird Conservation, our initiatives begin with the mission to save Pacific island endemic avifauna through collaboration with local stakeholders. As soon as is feasible we implement education and outreach initiatives to build sustainable trust and partnership within the island communities. We work to meet with the local populace on their terms regarding conservation messaging by assessing their knowledge and traditions about wildlife and seeking invitations to communicate the PBC mission in public arenas such as local markets, public libraries, and museums. One of the most beneficial ways to reach the heart of any community is by connecting with local youth. 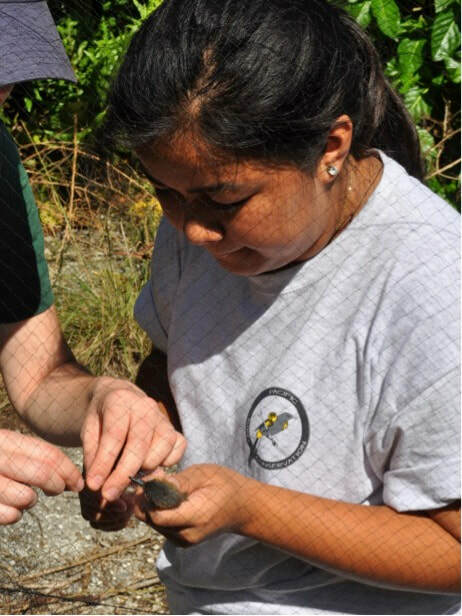 The Mariana Avifauna Conservation Program exemplifies PBC’s long-term education commitment in the Commonwealth of the Northern Mariana Islands (CNMI), where over the past several years we have fostered relationships with the local public school system, private schools, and colleges. The MAC Intern program gives budding biologists and conservationists the opportunity to gain hands-on experience in the field. A new collaborative hands-on project will bring habitat enhancements right onto public school grounds, offering a living laboratory for students and teachers that will generate curriculum to teach the next generation about the connection between healthy forests and healthy native bird populations. At PBC our goal is to give local island communities the tools, knowledge, and inspiration to protect their native avifauna and associated habitats long after our field missions are complete. ​MAC Program internship for participation in translocation field work and avian husbandry on Tinian, CNMI. 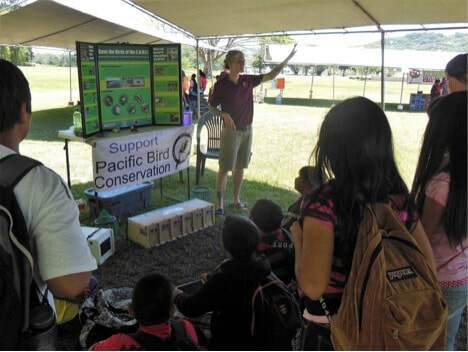 ​MAC Program teacher workshop for curriculum on bird conservation in public schools on Saipan, CNMI. ​MAC Program short presentation for all public school 4th and 5th graders rotating though exhibits at Environmental Expo, Saipan, CNMI.